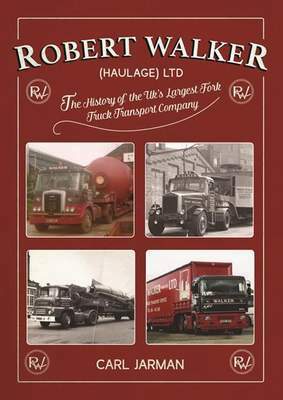 This book tells the story of Robert Walker Haulage. Established in 1935, Robert Walker never intended to run a haulage business; he initially bought a lorry to carry the produce from his market garden to the local markets. He then branched out into other types of transport work including carrying prisoners of war! Later, his forward thinking sons Brian and Eric saw a niche market in the transport of fork lift trucks and decided to try converting an old R.A.F. trailer into an early fork lift truck carrier. Today the company is in the hands of the third and fourth generations of the family and despite its humble beginnings, it is now the largest fork truck transporter in the UK. The book details the history of the company’s success including anecdotes from people that have worked for or with the company over the years. It details how Walkers carried Donald Campbell’s Bluebird around on his exhibition tour of 1965 after setting his land speed records between 1955 and 1964, and shows how ERF played a major role in the expansion of the fork truck transport business. Including 229 previously un-printed pictures of the four wheel basic lorries that Robert used in the early days, to the latest vehicles operated by this specialist haulier, this book will be of interest to truck drivers and other transport enthusiasts. Carl Jarman has always had an interest in transport since ‘helping out’ at a local family coach firm in 1973 at the age of 12. He went on to do a heavy vehicle mechanics course for HGV/PSV, then started driving coaches and trucks. He started his own coach firm in 1986 before moving onto operating lorries. He currently operate 2 lorries on UK haulage working for two different companies. He is a regular contributor to Truck and Driver magazine and the ERF magazine (REVS) and owns a classic 141 Scania which he restored with the help of his son into the colours of Astran, the famous Middle East haulier.